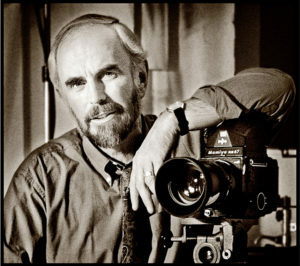 When I began taking photographs of Ireland some forty years ago I felt an immediate connection with Irish emigrants in America, the thousands of people who had left the old country to begin a new life in Boston and New York. The landscape back home was dotted with abandoned stone cottages and derelict farmhouses. The desolation reminded me of my own departure. I was forced out of Ireland myself at the age of fourteen, wrongly accused of stealing a bottle of lemonade at a country crossroads dance. The consequences of that Sunday summer evening was the reason I left my homeland far too soon. I naturally sensed a strange affinity with those who had journeyed out before me. All Irish emigrants of the old country keep some part of the homeland firmly in their memory, images of a time past that linger on in the mind exactly as we remember it, and held there forever unchanged. My own memories seemed to concentrate on the dark mysterious side of Ireland that I experienced in my youth, a time when many villages still had no electricity, and at night-time the homes were dimly lit with the calm flickering flames of candlelight and Tilly lamps. I remember too the small backroads where rural life was a daily struggle for both man and beast. Some years after my sad departure from my homeland I took up photography and got a job as a ship’s photographer traveling the world on a luxury liner. Later I opened a studio in London photographing celebrities. Fifteen years passed before I plucked up the courage to venture home on a visit to Ireland – it felt as though someone might still tap me on the shoulder and ask me to leave again. On my return home to Ireland I was immediately gripped with a strong desire to record a way of life that was fast disappearing – it was stealing away almost unnoticed in the rush of modernization. I wanted to capture the essence of that old world, celebrating its unfathomable beauty. Since I first took to the road with my camera back in the early 1970s, I have travelled to the remotest parts of Ireland, focusing on the dark underbelly of the land of my birth. 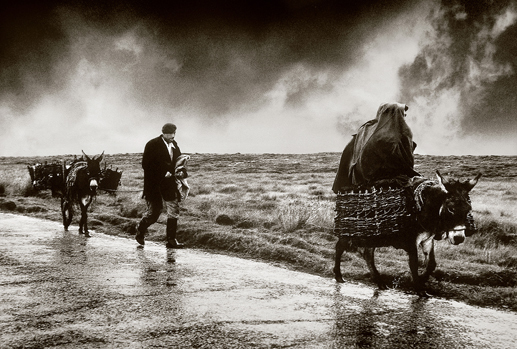 Peatcutters returning home in a rainstorm, Connemara, 1970. 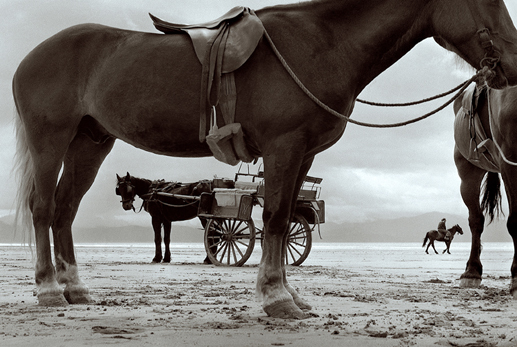 Horses and jaunting cart at Inch beach, Co. Kerry, 1970. 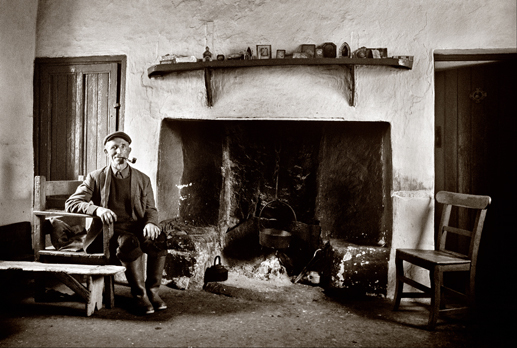 Peatcutter beside his fireplace, Co. Galway, 1971. 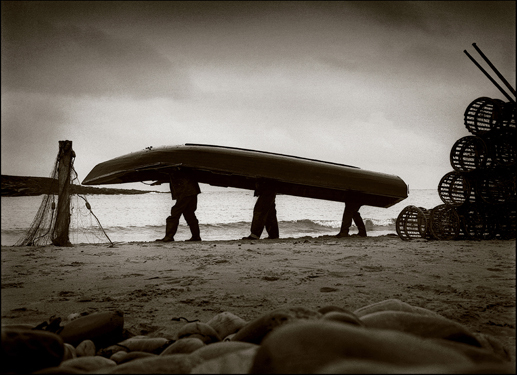 Beaching the Currach, Achill Island, 1985. 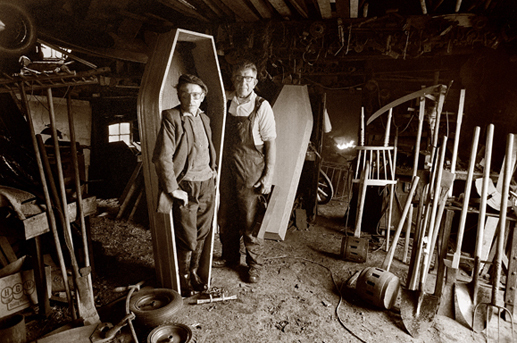 Coffin-maker, Ohermong, Co. Kerry, 1985. 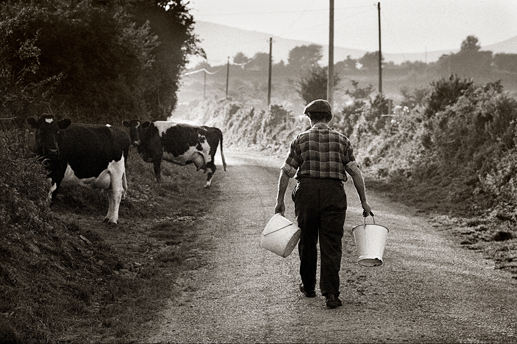 Milking time, Co. Waterford, 1990. 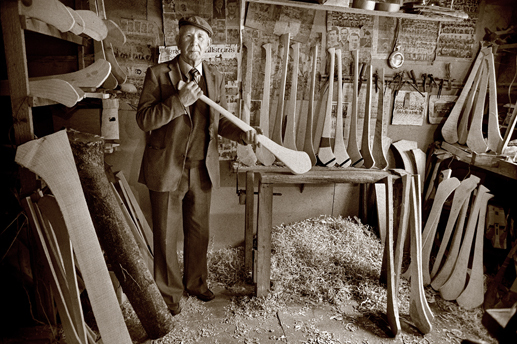 Photographer Richard Fitzgerald comes from Co. Waterford and now resides in London. For more information regarding his photographs, go to www.richardfitzgerald.com where you can view his Fine Art prints and posters. You can email him at studio@richardfitzgerald.com. Great story and that first photo from Conamara is a masterpiece.